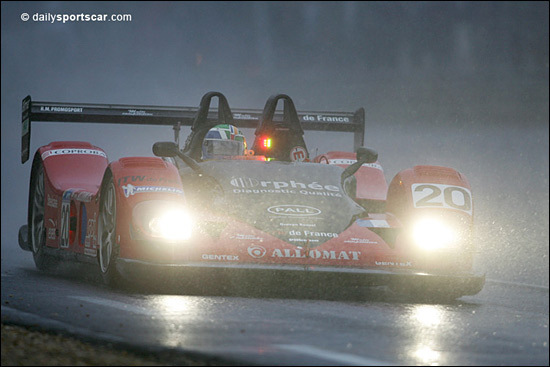 Interest in Mike Pilbeam’s MP93 LMP2 car has resulted in the commissioning of a second chassis, to race in the 2007 Le Mans Series and, entry permitting, at Le Mans. ”An ambitious team new to prototype racing”, has ordered the car, and it will be undertaking a full test programme before the season gets underway with the Paul Ricard test days. Pierre Bruneau’s PIR Competition took three podium positions in LMP2 this year, the first coming at the opening LMS race at Istanbul. Simon Pullan also sat atop the times, overall, at Le Mans this year, in Bruneau’s Pilbeam – for 43 minutes at the start of Wednesday’s qualifying. He set a quick lap early on in the well-balanced MP93, just as the rain started to fall. Here's Marc Rostan at the wheel later in that session.